Bulk offer - Buy 2 or more 4kg containers of Superfast for just £39.00 each. Thanks to a unique manufacturing process, Fi-Clor Superfast Granules have 78% available Chlorine which makes it the most powerful stabiliser-free chlorine currently available in the UK. It can be dosed directly into the pool and it dissolves rapidly to form high levels of active free chlorine to kill bacteria and help control algae. 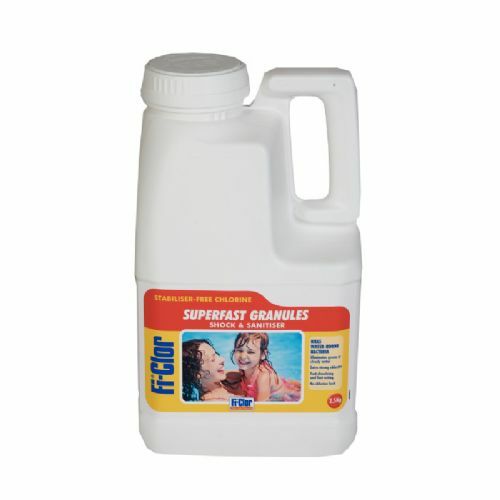 Perfect for use in indoor and outdoor pools, Fi-Clor Superfast can be used a Shock Chlorine treatment, and can also be used a regular Sanitiser. 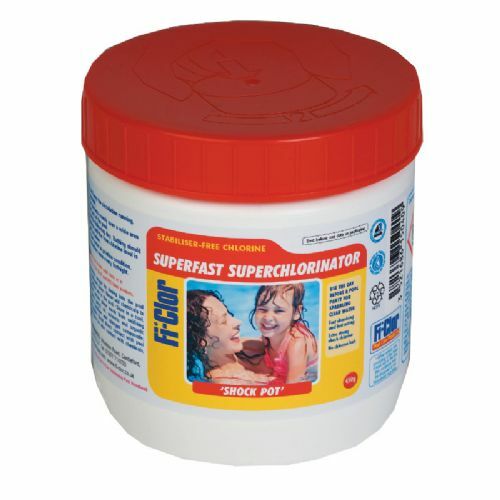 For indoor Swimming Pools, Fi-Clor Superfast is our most recommended product. As it is stabiliser free, it will not add any stabiliser (cyanuric acid) to your Swimming Pool, and will thus help avoid the problem of 'chlorine lock'. A 65g dose is sufficient to treat up to 11,000 gallons of water. Chlorine levels should be monitored frequently, and more product added as and when required. Always read the instructions on the container prior to use.